Review by AllTheBestFights.com: 2015-10-03, some good exchanges on the ground between Jessica Eye and Julianna Pena but it is not enough to get three stars: it gets two. Jessica Eye entered this fight with a pro mma record of 11-3-0 (36% finishing rate) and she is ranked as the No.9 women’s bantamweight in the world (currently the #1 in this division is Ronda Rousey) but she lost two out of his last three bouts, against Alexis Davis and Miesha Tate (=Tate vs Eye); between these two fights she won over Leslie Smith. Her opponent, the Tuf 18 winner Julianna Pena, has a record of 6-2-0 (100% finishing rate) and she entered as the No.10 in the same weight class. She suffered two consecutive defeats between 2012 and 2013, against Sarah Moras and DeAnna Bennett, but then she has won over Jessica Rakoczy (=Pena vs Rakoczy) and Milana Dudieva (=Pena vs Dudieva). 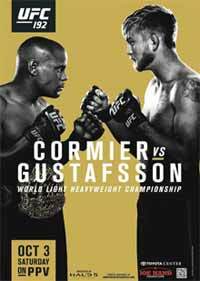 Eye vs Pena is on the undercard of Daniel Cormier vs Alexander Gustafsson – UFC 192. Watch the video and rate this fight!